After several weeks of travel here and there, we have finally settled into a missionary guesthouse for about a month. It is so nice to have a place to unpack our bags and feel at home! Ezra said, "I think Zeke and I will start calling this place home since we will be here for a while and our other home is so far away." We have loved staying with friends and family and traveling here and there, but it is really nice to now have a familiar place to be still and rest and come back to each night. 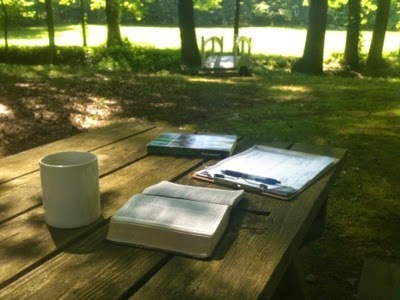 We have a quiet place where we can sit outside and have a peaceful time alone with God. I can't imagine a better way to start the day, than a cup of hot coffee with a chill in the air and time to pray and sing and read. I took a photo one morning because I wanted to remember this time. The ministry that makes our stay here possible is called Missionary Care Ministry. They have a beautiful house in the woods in rural Georgia, but it is only 10 minutes away from so many conveniences. It still blows my mind how fast and easy it is to get food in America, not to mention all the variety. But here at our "home" for a month, we also have a place where we can cook if we want. Last night we had a dear friend over for dinner and grilled out. That definitely made us feel at home. The kids have loved exploring in the backyard, building a dam in the creek, and playing badminton in the grassy areas. Today I was even able to have 3 of my children cuddling with me on the hammock as Esther read books to her younger brothers. It was such a nice time to slow down and just be together. I wish I had a photo of that moment too, but I knew if we got out of the hammock to get a camera, it would be very difficult to all get back into our places without conflict. I opted instead for taking a mental picture and sharing it with you in words. God has been so gracious to us in many ways as we have come back to the US. We have seen his care for us in providing for all of our needs and more through many of you. We also thank him for his provision of this wonderful home away from home. If you want to know more about this amazing ministry to missionary families, you can click on the link above. Their website also has information about how to donate if you want to help support this ministry.